A lesser-known, calm and quiet settlement in the capital city of Kerala, Varkala is an emerging pleasure seekers destination. Varkala is mainly renowned as a pilgrimage centre for the Hindu community. Apart from this, Varkala has everything to offer for an enjoyable vacation. The naturally beautiful setting of the ruby red cliff of Varkala will take your breath away. And the 2000-year-old shrine, the Janardhana Swamy Temple that stands on the cliff is the major attraction of tourists. The architectural grandeur of this temple inspires the heart of architecture lovers. Varkala is a unique destination that pleases every category of tourists. The Papanasham Beach or the “Beach of Redemption” is considered as holy. It is mainly associated with ancestor worship. A holy dip in the waters at this beach is believed to cleanse away all the sins. The Shivagiri Mutt is yet another pilgrimage centre in Varkala. It is the tomb and 'samadhi' of the great social reformer and philosopher Sree Narayana Guru. Varkala is not all about pilgrimage centres and temples. Soak your souls in tranquillity at the Kapil beach. Relieve the days of colonial rule at Anjengo Fort. Besides sightseeing, Varkala also offers opportunities for shopping and experiencing cultural activities. You can enjoy Kathakali performance by local artists at Varkala Culture Center. If health and fitness are in your mind, rejuvenate yourself with Ayurvedic massages. 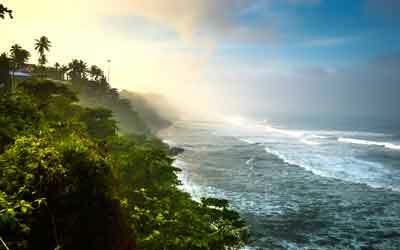 Pay a visit to Varkala, a perfect escapade for the weary travelers. Indulge yourself in the watersports at Varkala Beach. Get amazed at the wonderful sight of Kappil Lake touching the Arabian sea from the Kappil Beach. Capture some stunning photographs of Kappil Lake with coconut grooves in the backdrop. Enhance your knowledge of history at Anjengo Fort. Soak in spirituality at Janardhana Swami Temple. Pay a visit to Sivagiri Mutt. Be aware of strong currents at the beach and not swim out too far especially during monsoon season. Make sure you carry cotton clothes, sunglasses and sunscreen. October to March(winter) is the best time to visit Varkala. Varkala receives both the northwest and southwest monsoon. Because of the heavy rainfall, many visitors won't prefer this season to visit Varkala. But the real beauty of this place can be witnessed during monsoon season (July-September). The temperature during the months of April to June(summer) is unbearable. So, it is least advisable for visiting Varkala. By Air :Trivandrum International Airport, located at a distance of 46 Km, is the nearest airport to Varkala. By Train : Varkala Railway Station, located at a distance of 3 Km, is the nearest railway station. By Road : Varkala is well connected to all major cities of India through NH 47. Shop traditional handicrafts from Beach Bazaars. You can find unique Indian crafts and clothes in Seaside Cliffs. Tibetan Shops in Varkala houses great items from Rajasthan & Kashmir with traditional ornaments and local attire. You can get leather goods, clothes, hair oil and cooking oil from Khadi Store.